The main news from the visit of the Russian prime minister Dmitry Medvedev in Sofia at the beginning of the week is that the visit really happened. After 7 years break in such high level visits it seems that the recent one is normalizing the relations between the two Slavic states. The process started last year with a meeting of the newly elected then Bulgarian President Rumen Radev with President Vladimir Putin in Sochi followed immediately by a visit of the Bulgarian prime minister Boyko Borisov to Moscow. The main focus was the routing of the second pipe of Turkish Steam gas project targeting customers in Serbia, Hungary, Austria and then other EU countries. Geographically Bulgaria is the best option and it has the necessary infrastructure. So the project is equally beneficial but ... But the shadow of the failed South Stream pipeline is obscuring the situation and in a way poisoning it. Just to recall: nevertheless that the South Stream was agreed and the pipes delivered to Bulgaria, the project was blocked by EU and the government at that time (again led by Borisov) didn’t manage to support it effectively. Behind the scene there was also a pressure from across the Ocean due to the already starting (before Trump) US anti-Russian paranoia. Bulgaria lost face and Russia lost money. That’s why this time President Putin requires what he calls “iron strong guarantees“ from EU that the project will not be blocked. The situation resembles the one with North Stream 2 with the difference that the first project is supported by the strongest EU economy and the second one - by the weakest one. Additional obstacle is the fact that the EU still, as Kissinger pointed out a long time ago, does not have a telephone number. On foreign policy one can call Federica Mogherini and at least initiate some talk, but on economy and business matters there is nobody on the line. The Bulgarian PM is trying to balance between East and West but he has not enough balancing weight to leverage the country’s interests. At the same time the US military interest towards Bulgaria is growing in the light of the US-Turkey tensions and the new nuclear weapons arms race which is starting intensively. So it’s an impasse situation complicated additionally by the upcoming EU elections and then change of the Commission. A new one will be potentially operative not before autumn the earliest but it’s not excluded that it might take longer. The Turkish Steam Second pipeline is much more important for Bulgaria than for Russia, because Russia always can find an alternative. Bulgaria's need of about 3M cubic meters of gas per year is guaranteed until 2030 but the country’s problem is that if gas stops to be channeled through Ukraine, the Bulgarian serious gas transportation infrastructure will remain empty and the now existing income will disappear. So the only option for the government seems to be to bind the project to North Stream 2 which means to secure Merkel’s support. But this might be also risky - still the US pressure to stop it continues and if the two projects are in one basket they can go to hell all together. And second - it’s not sure that German interests coincide with the Bulgarian ones on that matter. That’s how we come back to the first line conclusion: that the main result from Medvedev’s visit to Sofia is that the visit happened. Because normalization of the relations of Russia with any EU country - including the most in-important and dependent one - is opening space for dialogue. And sometimes small and in-important countries are the best place for that purpose. Especially if that country’s population shares the highest level of sympathies towards Russia compared to all other EU states. 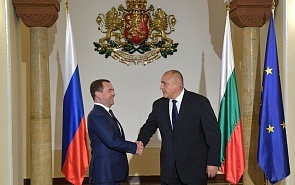 ﻿On March 4-5, 2019, Russia’s Prime Minister Dmitry Medvedev paid an official visit to Bulgaria. The purpose of the trip was the normalisation of bilateral relations in connection with the European Union’s sanctions policy against Russia, the deepening of trade and economic cooperation between Russia and Bulgaria, the discussion of topical issues of Russian-Bulgarian investment, scientific, technical and cultural/humanitarian cooperation, as well as the implementation of joint projects in the energy, industry and tourism sectors.